Find out about the standards that you can expect from hospitals, GP’s, dentists, care homes and care that is provided in your own home here. SpeakOut is pleased to welcome the International Community Organisation of Sunderland (ICOS) as new SpeakOut members. To view all of our members click here. To apply to become a member, click here. Susan Maddock, Labour parliamentary candidate for Torbay claims there are four core barriers. Mental health remains the Cinderella of public health issues as it still does not get the attention it deserves from policymakers and there is too little focus on preventive measures, it has been claimed. The NHS requires a radical transformation in the way care is provided if it is to meet the health challenges of modern society and ease the financial strain on the service, a major report has concluded. CQC’s latest bulletin for Healthwatch is available here. CQC has published new handbooks for GP’s (including out of hours services), adult residential care and home care services. These guides set out the process by which providers will be inspected and will help them to understand what is expected of them. A comprehensive report of GP out of hours services, which SpeakOut groups contributed to, has also just been published. You can download it here. Over the past year CQC has been consulting on new proposals for regulating and inspecting health and social care services in England. A number of SpeakOut groups have been centrally involved in this. The consultation report has now been published and can be accessed here. CQC is changing the way they will regulate and inspect services - with some of the most significant changes being around how they will now rate services. This new system for rating will highlight where care is outstanding, good, requiring improvement or inadequate enabling people to compare and choose services. The three Chief Inspectors have produced a short video to introduce these changes which you can view here. The Care Quality Commission (CQC) is developing work on involving children and young people in their inspection work as young Experts by Experience (ExE). 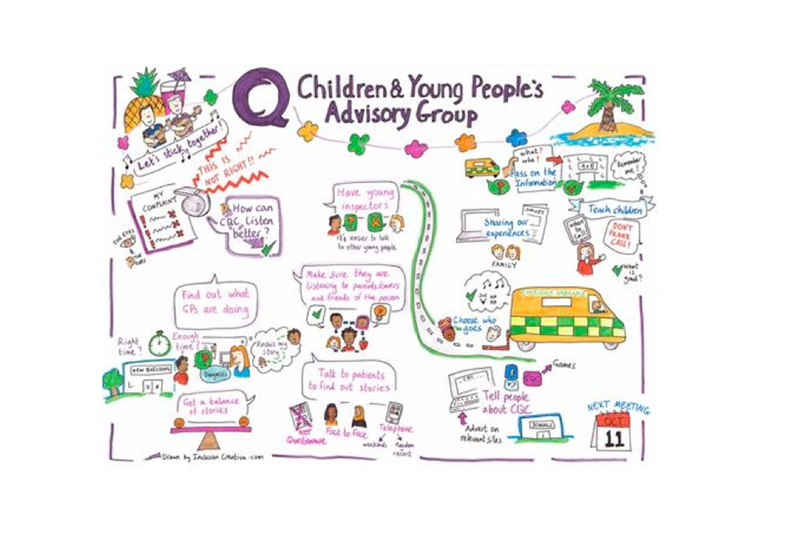 To help with this work CQC has set up a children and young people's advisory group that meets every three months to help design the best ways of working with children and young people. The advisory group has now been in place for a year and half and some of the young people have gone on to become young ExE. CQC is now looking to recruit more children and young people (aged 8 to 21 years) who have experience of using care services, or of caring for someone who use services. In return for your time CQC will give you £30 high street vouchers and will also pay for your travel expenses. See attached for more information. If you are interested in applying please complete and return the attached application form to Aileen Hamdan Aileen.Hamdan@cqc.org.uk by 9am Monday 15th September. For more information please contact Aileen on 07795 617 71. Note: Aileen will be on annual leave between 11-29 August. Any questions during this period, please contact Maria Ostoja-Starzewski on 07789 876 586. CQC’s monthly newsletter for anyone interested in health and social care is available here. CQC’s August Healthwatch bulletin is available here. CQC’s July Healthwatch bulletin is available here. Mencap’s document ‘Making Myself Clear’ provides some good general guidelines on making language more accessible for people with learning difficulties. The Care Quality Commission has announced that independent (private) hospitals will begin to be inspected under its new inspection approach. The Chief Inspector of Hospitals Sir Mike Richards has identified eight independent hospitals to be inspected. These vary in size and in the number and type of services they provide, including both NHS-funded care and solely private care. The first inspections will take place from October to December 2014. They will include announced and unannounced elements and may include inspections in the evenings and weekends when we know people can experience poor care. Inspection teams will include clinicians from the NHS and the independent sector, CQC inspectors and members of the public who are “experts by experience”. The latest CQC newsletter is available to view here. Last year a number of SpeakOut groups supported CQC with a themed inspection looking at the experiences of young people aged 14 to 25 with complex physical health needs moving from children’s services to adult services (Children’s Transition to Adult Services). The report has now been published today. You can read either a summary of the report or the full report here. CQC’s monthly briefing and update for Healthwatch is here. It contains information about the inspections that will be taking place between July and September 2014. CQC’s monthly briefing for dentists, GP’s and primary medical services is here. Professor Steve Field (CQC’s Chief Inspector of General Practice) has published his latest briefing for GP’s and dentists here. SpeakOut groups have been asked to support this work by organising ‘liustening events’ for their members and service users. Find out which Trusts will be inspected and how you can get involved here. (If nothing seems to happen, check for a word document in your downloads folder). A big welcome to all our new members (Feb 2104). We have just finished recruiting new members to help CQC with its latest inspection programme, which will include inspections of acute hospitals, GP and primary care services, community health services, mental health trusts, care homes and the care people receive in their own homes. You can see a list of all our members here. SpeakOut will be supporting this new programme of inspection and we are seeking community groups with links to hard to reach and marginalised groups of people, including those with protected characteristics under the Equality Act to help us. Although we have finished our formal recruitment round we are always open to new members. CQC have updated their on-line form for telling them about your experiences of health and adult social care services. The latest version of the Share Your Experience form gives CQC valuable feedback about how services are performing, and they will take this feedback into account when they decide whether they are meeting national standards. SpeakOut groups have been enjoying a very busy start to the new year! Members have been busy supporting inspections of acute hospital trusts in Leicester, Hull and London St Georges with more events scheduled in Leeds and Dudley. Members have also been supporting inspections of out of hours GP services in Manchester, Derby, Kirklees and Cambridgeshire with further work planned in Suffolk. Elsewhere, members have been busy supporting Healthwatch England to consult on its draft framework of rights and responsibilities. A huge thank you goes out to everyone who has been involved. We will publish a summary of the key findings in the web-site in due course. The High Court has ruled councils must support disabled children in travelling families, even when they move to other parts of Britain. In a decision welcomed by the Equality and Human Rights Commission, the court ruled Worcestershire Council must support a three-year-old boy even when he is in another part of the country. He ruled that Worcestershire Council was able to exercise its power outside of its area, and should continue funding any provision it had put in place for the child. The People’s Post Code Lottery has announced its programme of small grants funding for 2014. Projects can be funded for up to 12 months and grants can be from £500 - £20,000. Funding is being rolled out regionally – with applications from the North of England being accepted until 21st February. Applications will then be accepted from the South of England (excluding London) until the 20th May, the Midlands until the 19th July and London until 7th November. For full details of the funding programme and the dates that apply to each region click here. The Care Quality Commission (CQC) has published the first reports from its new programme of hospital inspections. The inspections, under the leadership of CQC’s Chief Inspector of Hospitals, Professor Sir Mike Richards involved significantly larger inspection teams than CQC has used in the past. The teams – called inspection panels - included doctors, nurses and other experts and trained members of the public. For the trusts concerned, they covered every site that delivers acute services and eight key services areas: A&E; medical care (including frail elderly); surgery; intensive/critical care; maternity; paediatrics/children’s care; end of life care; outpatients. The inspections were a mixture of announced and unannounced visits and included inspections in the evenings and weekends when we know people can experience poor care. On the evening of the first day of each inspection there was a ‘listening event’ where local people were able to tell members of the inspection panel their views of the hospital’s care. Chief Inspector of Hospitals, Professor Sir Mike Richards said: ‘These reports mark an important milestone in our new approach to hospital inspections. By using larger teams including more experts and people who have used hospital services, we have really been able to get under the skin of these trusts. The inspections have been backed up by CQC’s new intelligent monitoring, giving the teams the information they needed to focus their inspections on areas of concern. Overall, 136 people were involved in the four inspections. Of these 18 were doctors, including junior doctors; 17 were nurses, including trainee nurses; and 15 were trained members of the public with experience of hospital services. About 250 people attended the listening events to give us their views on care – many others contacted us in other ways. Overall, the report concludes that the new senior management team at the trust are working hard to change its culture, and while it is early days, this seemed to be having a positive impact. Despite this there were still areas of the hospital where care needed to be significantly improved. CQC found that some outpatient clinics were poorly organised and significant numbers of older people were being discharged in the evening. Inspectors were also concerned about low staffing levels affecting patient care especially in wards for older people. The poor physical environment in A and E and in some other parts of the hospital made the delivery of care difficult. Overall the report concludes that patients at Airedale General Hospital were positive about the care they received. Staff said that they felt proud to work at the hospital. There was a good sense of community, with high levels of volunteering. The trust is well-managed and benefits from a stable, experienced board and a clear governance structure. This is paying dividends in high levels of staff engagement and patient satisfaction. Overall the report concludes that The Royal Wolverhampton NHS Trust is generally providing patients with safe and effective care. However, there are a number of areas for improvement. There was a shortage of midwives and concerns regarding staffing in surgical care and wards caring for older people. Overall the report concludes that Musgrove Park Hospital is providing patients with safe and effective care. But the hospital is dealing with a high number of patients and the quality of care and the effectiveness of treatment was affected at busy times. Some patients were experiencing long waits for surgery and outpatient appointments. This year CQC carried out 35,000 inspections of health and social care services in England between April 2102 and March 2013. The State of Care report brings together the findings about the quality of these services and also takes a special look at the pressures on accident and emergency. Health Profiles provide summary health information to support community & voluntary groups to deliver health improvements. The profiles give a snapshot overview of health for each local authority in England, presenting a set of health indicators that show how the area compares to the national average. You can download individual area profiles on the Health Profiles Website. The website also has a summary document and a useful set of FAQs. CQC has unveiled its new proposed approach to inspecting specialist mental health services: A fresh start for the regulation and inspection of mental health services. CQC inspections will put a greater emphasis on inspecting the care that people with mental health problems receive in the community. The new approach will also look at how community mental health services work with other organisations that are important in supporting recovery in mental health. In cases where people are detained under the Mental Health Act 1983 for treatment or where they have had their liberty restricted, CQC will focus more sharply on ensuring that their rights are protected. Central to CQC’s approach are new ways of engaging with people who use services, their families and carers, during inspections and at other times. This will include helping CQC to develop its new ways of working. Complaints made by people who use services will be a key source of information. Mental health experts and organisations are also helping CQC formulate its new approach. CQC’s monthly news bulletin for anyone interested in health and social care is available here. CQC’s Acting Together programme enables people who have experience of using health, social care and mental health services and their family carers to get involved in everything that CQC does. This can include a range of things such as helping CQC to develop new ways of working, co-producing public information, taking part in events and consultations, and CQC staff training. Within Acting Together there are people who have experience of using care services and have been trained to take part in CQC inspection activities and Mental Health Act visits. They are called ‘Experts by Experience’. They accompany CQC inspectors and Mental Health Act Commissioners on visits where they talk to people who use services and their family carers and observe the environment around them. They have first-hand experience of receiving care so they know which questions to ask to get as much information from the visit as possible. Their findings are used to support the inspector’s judgement on the service and can also be included in the inspection report. CQC is currently working with around 300 Experts by Experience. For Acting Together CQC works with a number of support organisations that recruit, train and support people to work with them. A list of these organisations, the people they support and their contact details can be found below. If you would like to express an interest in becoming involved in Acting Together, please look at the list of support organisations below to see which might be the most relevant one for you and contact them directly. Support people who have experienced drug and/or alcohol dependency. Support older people and people with dementia and their carers. Support family carers of people with high support needs (e.g. challenging behaviour, mental health needs, profound and multiple learning disabilities). Support people with learning disabilities and their carers; people with physical and/or sensory impairments and their carers; people who have used mental health services and their carers; and people with experience of detention under the Mental Health Act. If your experiences span a range of support organisations and are not sure who to contact, please contact Jane Golden, CQC Involvement Officer Jane.Golden@cqc.org.uk Tel: 07798816274 or alternately email: enquiries@cqc.org.uk or call 03000 61 61 61 for more information or to discuss the options. CQC has formally written to all SpeakOut groups to thank them for the enormous contribution that they have made (and continue to make) to CQC’s work, especially the recent strategy review and the on-going acute hospital trust inspections. You can read the letter here. CQC’s latest news update for Healthwatch can be viewed here. It contains news aboutCQC’s new apprach to inspecting social care services under the leadership of newly appointed Chief Inspector, Andrea Sutcliffe. It also contains an update regarding the new inspection regime for acute hospital trusts, including how SpeakOut have been involved in helping CQC to reach out to community groups. •a senior NHS clinician or executive. •acute medical and surgical pathways. •care for the frail elderly. •outpatients (including discharge arrangements and joint work with other sectors). SpeakOut groups are helping CQC inspectors get a feel for type of issues that they should look out for in Salford, Heart of England, Barts, South London and Nottingham where they will be organising bespoke listening events with hard to reach communities. You don’t have to wait for one of these events to get involved however. CQC have also organised a series of public listening events that you can go along to. Click on the link to find out if there is one in your area. Professor Steve Field will join CQC from NHS England and will lead the inspection and regulation of primary care services across the public, private and independent sectors. •champion the interests of people who use primary medical services. •make judgments about the quality of care provided. •ensure that health and adult social care services join up seamlessly. •introduce a ratings system for registered primary care providers. Professor Field said: “I am thrilled at being appointed the first Chief Inspector of General Practice in England. I see this as a wonderful opportunity to highlight what’s good in general practice and dentistry, and to shine a light on what isn’t. It’s an opportunity to make sure that all organisations are encouraged to live up to the standards of the best. “I have had a long-standing commitment to address health inequalities and this role will enable me to ensure that primary medical services put this increasingly important issue high on their agendas. It will also allow me to focus on making sure that people receive health and care services that are integrated. of SpeakOut groups helped to make the new Healthwtch film which can vieon ther homepage of the Healthwatch website. You can also see the film on YouTube. Regional Voices have published these fabulous Who’s Who guides to support the voluntary sector to engage with the new roles in health and care. The guides contain contact details for local Clinical Commissioning Groups, Local Commissioning Support Units, CQC inspectors, Health and Wellbeing Board Representatives, Local Healthwatch, NHS England Local Area Teams and Public Health. With a facility that allows you to search by locality or organisation, it has never been easier to find out the contact details for all of these people. Sir Mike Richards, the new Chief Inspector of Hospitals, is asking for clinicians, NHS professionals and members of the public to join his hospital inspection teams (July 2013). You may have seen the press coverage about CQC's new inspector for hospitals, Mike Richards. CQC is planning to work with a range of people during and around hospital inspections and hope to develop the work with local communities when looking at hospitals and are looking forward to working closely with the SpeakOut network. Experts by Experience are people who use services who accompany CQC inspectors on visits where they talk to people who use services and their family carers and observe the environment around them. Andrea Sutcliffe will be the first CQC Chief Inspector of Adult Social Care. Andrea joins CQC from the Social Care Institute for Excellence (SCIE), where she is currently Chief Executive. The Chief Inspector of Adult Social Care is one of CQCs’ new key posts, along with Mike Richards who joined this week as CQC Chief Inspector of Hospitals. The role of Chief Inspector of General Practice, has yet to be filled. Andrea will be responsible for developing the new approach to the way CQC regulates social care, including a rating system, in consultation with people who use and provide services. We are delighted to be able to offer some exciting new training for our members. Not only can choose from venues in the North or South, but we will also be able to reimburse all pre-agreed travel costs and pay a participation fee of £50 per member for attending. Many health and social care interventions are predicated on the deficit model – the idea that individuals or communities have problems that need fixing. Such approaches can lead to problems of labelling and stigmatisation and often create dependency. Over recent years a number of alternative models have developed which focus on identifying the strengths of individuals and communities and of finding ways to unlock these in order to empower individuals and communities to find their own solutions. This one day workshop will introduce participants to the principles and ideas that underpin strengths based work. Participants will leave feeling empowered and understanding their own strengths and will have been able to reflect on how they can use these new approaches to working within their own communities to bring about change. Safeguarding children and vulnerable adults is something that we all need to be aware of and training in this area has been repeatedly asked for by members. This training which will be useful for all members who might be unsure about how to identify and deal with potential safeguarding concerns relating to children or vulnerable adults. The first national conference for Healthwatch took place recently, putting the spotlight on the health and social care complaints process. Healthwatch’s role is to ensure that the voices of consumers and those who use services reach the ears of decision makers – even when those voices have something difficult to say. 48% of people do not have the confidence that formal complaints are actually dealt with (rises to 60% for the 55+ age group). Over 54% of people who had a problem with health or social care in the last three years did nothing to report it. 49% of consumers surveyed have no trust in the system and are crying out for an independent and easily recognisable advocate to deal with complaints. A video report by Healthwatch England shows what people think about complaints, what prevents them from complaining and what they'd like to see moving forward. The Care Quality Commission has written to all SpeakOuts groups to explain its position with respect to recent events at University Hospitals Morecambe Bay Foundation Trust. Details of the steps that CQC have taken to put things right can be seen here. The Care Quality Commission publish a quarterly newsletter with summaries of all their latest news and activities. Keep up to date with the Experts by Experience programme here. We know we are!!! This new poster will help you to understand who is who in the new health landscape. The Race Equality Foundation have recently released four reports and a website in conjunction with Regional Voices, Disability Rights UK and NAVCA. The resources are designed to showcase the good practice carried out by LINks and to provide guidance during the transition to HealthWatch. More information and links to the report are available here. You can also get the latest Race Equality Foundation newsletter here. The Centre on Dynamics of Ethnicity (CoDE) at The Economic and Social Research Council has prepared a series of briefing documents on the 'Dynamics of diversity: evidence from the 2011 Census'. Topics include: the growth of ethnic group populations; Britishness; segregation and mixing; and immigration. You can download them here. Healthwatch Communities Involved is a new information source for individuals and communities to keep up to date with Healthwatch. Take a look! The Local Government Association have published further guidance for Local Healthwatch about engaging with effectively with the widest range of people. The Care Quality Commission have published a short summary of the outcome of their strategic review which details the six key areas that they will focus on over the next three years. You can down load a summary by clicking here. CQC have already appointed Professor Sir Mike Richards as the Chief Inspector of Hospitals. As Chief Inspector, he will oversee the inspections of all hospitals to make sure that health care is safe, effective, caring, well-led and responsive to patient’s needs. The Care Quality Commission publish a regular monthly newsletter. The latest one can be viewed here. The British Institute of Human Rights have published a useful list of resources for organisations working to protect and promote human rights. You can download it here. SpeakOut groups have been working with CQC to help them to review their strategy for 2013-16. You can see the latest updates here. Six SpeakOut groups have just completed work on a new film for HealthWatch. You can view it here. If, like us, you are baffled by the new health and social care landscape and who now does what, you may find this short guide very useful. Produced by the Care Quality Commission to help enlighten their own staff the document will tell you (almost) everything you need to know about the NHS Commissioning Board, Monitor, Healthwatch England, Clinical Commissioning Groups, Health and Wellbeing Boards etc. etc. Simples!!!! We have reported on the work of experts by experience elsewhere on this site from time to time. You can read an article about their work here. Healthwatch England has just published its first newsletter. You can download copy here. The Care Quality Commission’s has recently published the result of its reviews of privacy, dignity and nutrition in care homes and hospitals. The 2012 Dignity and Nutrition Inspection Programme (DANI) found that while most older people were having their needs met, a significant number of hospitals and care homes needed to make improvements, and that often, small changes could make a big difference to people’s experience of care. •Of the 500 care homes we inspected, 84 percent respected people’s privacy and dignity and 83 percent met people’s nutritional needs. This means staff were aware of people’s likes and dislikes and made sure people with dementia were given support to choose and eat their food. •However, there were times when people did not receive help to eat and drink, or be given personal care in private. •Following on from our 2011 report on respect, dignity and nutrition, we found improvements in the way people’s nutritional needs were met, with 88 percent of hospitals visited making sure people were helped to eat and drink compared to 83 percent in 2011. •However, fewer hospitals were respecting people’s privacy and dignity, with 82 percent meeting people’s needs compared to 88 percent in 2011. CQC inspectors saw call bells left unanswered, leaving people without help to get to the toilet and without support for other needs. You can find out more about the Dignity and Nutrition Programme and download the report in full here. The Care Quality Commission’s (CQC) second Care Update is now available to view. Drawing on information gathered from more than 20,000 CQC inspections the report offers a view of health and social care services in England in the nine months to December 2012. It concludes that people with dementia are not receiving care which meets their needs because health and adult social care services are struggling to cope. It concludes that those services involved in caring for people with dementia must do more to make sure people get safe, quality care that identifies and meets their needs. Concerns are also expressed about the care of people with learning disabilities or mental health problems provided by independent hospitals and community services. These services still have some way to go to provide a good quality of care, and this weakness in performance has persisted for some time. The final report of the Mid Staffordshire NHS Foundation Trust Public Inquiry was published on Wednesday 6 February 2013. You can download the executive summary of the Francis report here. You can find out more about the inquiry here. You can read the Care Quality Commissions response to the report here. SpeakOut member Sharon Smith has been showcasing resources to help service providers and commissioners plan for the needs of Gypsy Roma Travellers. You can see her powerpoint presentation about cultural aspects of Gypsy Roma Traveller life here and download a copy of a report that she worked on with Barnsley Black and Minority Ethnic Initiative about the mental health needs of Gyspy Roma Travellers here. Sandwell African Caribbean Mental Health Foundation and Oscar Sandwell have both joined the SpeakOut as new members this month. You can see all of our members on the SpeakOut members page and read updates and news from them on the member notices page. Healthwatch England, the new health and social care consumer champion, launched on 1st October 2012. Healthwatch England are very aware that they do not hold the copyright on people’s experiences and cannot deliver on their remit alone. Third sector organisations are often expert advocates for their communities and can provide vital insight. Where necessary, Healthwatch England can use their national position to identify a bigger picture and use their statutory powers to support that third sector expertise, publicly advising policy makers and regulators. Given the need to work broadly across the sector, it is essential the third sector have a clear understanding of the remit of Healtwatch England. With this in mind, Healthwatch England have developed a short six-question survey to help them form a picture of third sector senior directors understanding of Healthwatch England. The knowledge gleaned from community and voluntary sector will help to develop Healthwatch Englands communications and engagement activity across the sector. You will see the final question relates to a potential Healthwatch Alliance. Over the next 18 months, Healthwatch England will aim to bring together organisations who would like to work with the Healthwatch network at a local and national level into an informal 'alliance', which will provide the network with a bedrock on which to search for like-minded stakeholders. David Prior is to be the new Chair of the Care Quality Commission. David is currently Chairman of the Norfolk and Norwich University Hospitals NHS Foundation Trust. David Prior said: “I am delighted to have been appointed Chairman of the Care Quality Commission (CQC). It is the only job that could have persuaded me to leave the Norfolk and Norwich University Hospital. “People who are ill or not able to live independently should be able to expect high quality care. Where there is benign or, worse, malign neglect there must be zero tolerance. I am a believer in the NHS but not a reflex defender of the NHS. Those who provide care out of hospital, in care homes or in people’s own homes, should also be held to account where standards are not good enough. David Prior will take up his role as CQC Chair on 28 January 2013. On 1 December 2012 a new body called the Disclosure and Barring Service (DBS) came into effect. This resulted from a merger of the Criminal Records Bureau (CRB) and the Independent Safeguarding Authority (ISA). You can find answers to some of the questions you might have about the changes in this CQC factsheet. The Care Quality Commission has just published its annual State of Care Report looking at care services in England and the quality of care that they provide. The findings are based on the results of over 13,000 inspections at hospitals, care homes, home care agencies and other care services across the country. The report highlights that there are more people living or longer and with very complex needs. Some services are struggling to cope with these pressures, which is affecting the quality of care they are providing. Download the report here. The UK Disabled People’s Council (UKDPC) is delighted to announce a rich programme of free events to celebrate Disability History Month (22 November to 22 December), as part of the Together! 2012 festival of Disability Arts, Culture and Human Rights. These include a series of Arts Workshops, a three-day Film Festival, a Poetry Week, a conference on the UN Convention on the Rights of Disabled People, exhibitions, performances and more. For Disability History Month, UKDPC has teamed up with a number of partners including the University of East London, Channel 4, Greenwich Leisure, the TUC and Newham NDP, in addition to our existing partners including the East London NHS Foundation Trust, DaDaFest, Aston-Mansfield and Disability Arts Online. “Disability History Month provides the opportunity to build on the success of the Paralympics and to raise awareness, not just of the issues facing disabled people today, but also of our history and heritage and our unique culture. In 2013 we will be helping to launch a new organisation with the aim of making Newham an international centre of excellence for Disability Arts, and we hope this is just the first of many Disability History Month festivals to come." By post: UKDPC, Stratford Advice Arcade, 107-109 The Grove, Stratford, London, E15 1HP. As regular visitors to this site will be aware, aware Healthwatch England launched on 1st October 2012. You can find out more about the launch, and watch a video of Anna Bradley, Chair of Healthwatch England, talking about her ambitions for the new organisation here. There is an exciting opportunity for SpeakOut members to join the Care Quality Commissions eQuality Voices Group. As an organisation CQC wants to consider equality and human rights in everything we do. We are looking for new members to join this group who monitor CQC s progress with equality and human rights. Four members of SpeakOut (Karnail Sodhi, Asian Disabled Association; Janie Codona, One Voice 4 Travellers; Rabbi Simon Grant, Binoh and Mohammed Hanif, Al Hayat) are already a part of the group and we would welcome applications from more people who have an interest in this aspect of our work. The group meets 4 times a year in London. All travel and support costs will be paid as well as an involvement fee. If you would like to discuss further or need any help with the application process or we can put you in touch with the current members to find out more about the work they undertake please contact Alia Syed. Past newsletters also have information see here and here. Please note the closing date is Friday November 18th. On 1 October 2012, provisions from the Equality Act 2010 to do with age discrimination came in to force. It is now unlawful for service providers and commissioners to discriminate, victimise, or harass a person because of age. If a member of the public aged 18 or over believes that they have been treated less favourably when requesting or receiving goods, facilities or services because of their age, they will be able to take organisations or individuals to court – and may be awarded compensation. A case could be taken against health organisations (such as hospitals or commissioning bodies), individual clinicians (eg consultants, GPs or allied health professionals) or others working in the health sector (such as managers). The ban is only intended to prevent harmful uses of age. Positive use of age in providing, commissioning and planning services will be able to continue. The Act does not prevent differential treatment where this is objectively justified. Policy makers, commissioners, providers and individuals working in health and social care should continue to take into account someone’s age when it is right and beneficial to do so. You can read guidance on what the new measures mean from the Home Office and Department of Health. Healthwatch England launched on 1 October 2012. The day was marked by two events. Anna Bradley, Chair, and Amanda Hutchinson, interim Director, visited Chelmsford to talk to colleagues from the Healthwatch Essex Pathfinder about their experiences of building a local Healthwatch. In the evening a special event was hosted at Coin Street Neighbourhood Centre, where Anna Soubry, Parliamentary Under Secretary of State welcomed the launch of Healthwatch England. The event was also attended by over 120 stakeholders from local and national charities, Local Involvement Networks (LINks), and colleagues from local government and the Department of Health. In a specially commissioned short film for the launch, members of the public and people who use health and social care services (including a number of members of SpeakOut) speak about hopes for Healthwatch England and what is should achieve. Watch the video here. The Health Lottery is administered and run by the People’s Health Trust, a charity which works to address health inequalities across Great Britain. It raises money via 51 local society lotteries. In turn, it then funds a wide range of organisations and projects that are designed to reduce health inequalities according to local needs and priorities. The People’s Health Trust has begun a discussion with local people to help identify what its priorities for funding should be. The New Economics Foundation and the University of Central of Central Lancashire have agreed to work together to facilitate discussions with marginalised and seldom heard groups in three geographical areas - Birmingham and Solihull; Hampshire, Southampton, Portsmouth and the Isle of White; and Suffolk. Three SpeakOut members - The Birmingham LGBT Trust, Awaaz FM and Age UK Suffolk – are supporting the work by involving people locally in discussions about: the causes of health inequalities; the particular health issues and health inequalities experienced specific, marginalised groups; and the identification of local priorities for grants from the Health Lottery. In these two short video clips David Behan, CQC’s new Chief Executive, and Lorraine Denoris, Programme Director for Healthwatch Implementation at Local Government Association, reflect on how local Healthwatch services are developing across the country. Macmillian Cancer Support have published new training material which is designed to support the involvement of patients and the public in research. You can download a copy of the materials here. The resource is written for a mixed audience of both lay people and professionals and is designed for everyone who has an interest in health research. No formal scientific training is required to understand it. All that is required is an interest in working together in a constructive and active research team. CQC has started the second stage of its strategic review and are asking for your views on its plans for the next three years. CQC's vision of success is a health and social care sector where more services provide care that meets national standards of quality and safety. This means that more people will receive better care. •how CQC manages its independence. •how can CQC measure its own impact. •CQC's relationship with the public and with organisations that provide care. •CQC's role in the complaints system. These documents provides more information about the Review. The consultation will close on Thursday 6 December 2012. SpeakOut will be holding specific events for member groups in November and will be inviting you to take part. An email about how you can get involved will be sent out very soon. Jo thanked staff for their support during her time as Chair and for their commitment to improving care for people who use services. She went on to say that it had been a privilege to be the Chair of CQC, but that it was a now a good time to step aside and for a new Chair to continue to build on achievements to date. She will remain in post until a new Chair is appointed. Led by Mind and Rethink Mental Illness, Time to Change is England’s biggest ever attempt to end the stigma and discrimination that faces people with mental health problems. Funding is currently available for projects that bring people with and without mental health problems together to challenge discrimination in their communities. 25% of the funding available will be used to fund projects run by and for people from Black and minority ethnic communities, so this funding stream may be of particular interest to SpeakOut members. Successful applications will involve people with mental health problems in the planning and delivery of the project and will focus on promoting positive social contact between people who have experience of mental health problems and people who do not. Bringing people together in this way is seen as a key mechanism for reducing stigma and discrimination. Funding will not be provided to develop or deliver services to people with mental health problems or to run awareness raising or education sessions. The closing date for this round is 12 noon on Friday 21st September 2012. Click here for further information and guidance. Anna Bradley has been appointed as the Chair of Healthwatch England and a CQC Board member. "I am very excited about this opportunity to represent and amplify the voices of people who use the health and care system. I am clear that those who run, commission, and regulate services need to learn from the people who use those services,” said Anna. “Healthwatch England will act as a champion for those who sometimes struggle to be heard. I am privileged to be determining the future shape of the organisation - and determined that it will make a genuine difference where it matters most. My immediate focus will be to identify strategic priorities for action, and then to ensure that these inform real change to the future of service delivery." Jo Williams, Chair of CQC, said: "I welcome the appointment of Anna Bradley to the post of the Chair of Healthwatch England. Throughout her career she has been a champion for the consumer and I have no doubt that she will bring to the post the necessary rigour and independence. I look forward to working with her to build a truly independent Healthwatch network which will enhance our regulatory work and help us identify and act against poor care, in the interests of people who use services." The new Healthwatch England website has just been launched. From April 2013 Healthwatch England and local Healthwatches will together act as the consumer champion for everyone who uses health and social care services in England. The latest CQC annual report has been published and is now available to download. SpeakOut groups are mentioned explicitly on pages 23 and 39 in relation to the contribution that they have made to the inspection framework and the equality and human rights workstream. Although not mentioned explicitly SpeakOut members were heavily involved in the Healthwatch branding referred to on page 33. The new health and care system will be up and running by April 2013. New organisations, and changes to existing roles are being developed over the course of this year. But what will the new system look like and how are the different parts of it supposed to relate to one another? The diagram below will give you some idea of the new structures and arrangements. You can download a bigger version here. SpeakOut is please to welcome the following new members. SpeakOut is hosting a series of regional conferences for members in July 2012. These will be held in Preston (2nd July), London (9th July) and Birmingham (16th July). As well as bringing members together to strengthen regional ties and links these events will update members with regard to the reform of the health and social care system, including the development of HealthWatch England and local HealthWatch. Members will also focus on the development of a training strategy for the network. We are delighted to report that three SpeakOut members have been selected to join the CQC eQuality Voices group. The group has a very important function overseeing that equality and human rights issues underpin all aspects of CQC work. Janie Codona from One Voice 4 Travellers, Wisbech, Karnail Sodhi from Asian Disabled Association, Derby and Mohammed Hanif from Chiraagh, Halifax were all successful in their applications. All three members have a wide range of skills, expertise and experiences and will be reporting back to the SpeakOut Network about their involvement in the eQuality Voices Group. “I’m currently Chair of Chiraagh a community based group that has been actively involved for more than 20 years in improving the health and well-being of the local Asian community in Halifax. I hope to take forward this knowledge to the eQuality Voices panel.” Mohammed Hanif. Surveys show that people from Black and minority ethnic groups consistently report lower levels of satisfaction with social care provision that White British people. The National Institute for Health Research (NIHR) is funding the National Centre for Social Research and the Universities of Stirling and Leeds to carry out research to explore the reasons for this. SpeakOut members Mohammed Hanif from Al-Hayat and Naseem Aboobaker from Mushkil Aasaan have been appointed to a project advisory group to assist with the research.